BLACK_LINEN_Envelopes__Paper is rated 4.8 out of 5 by 46. Rated 5 out of 5 by MOwens from Exactly as advertised! Not only did I receive exactly what I ordered, I received them a day earlier than projected! My wedding invited will be in the mail this week! Rated 5 out of 5 by VickiL from Purchase 5 stars I purchased black envelopes. Were exactly what I needed. Quick to ship. Rated 5 out of 5 by Jenjen from Great features! I bought this before and I am really happy I did it! Rated 5 out of 5 by MaureenE from Bold, catches the eye! I am so glad I bought these envelopes. They are bold, smooth and stands out in the mail. They are a very good quality. Rated 5 out of 5 by NaNa T from "Black is Beautiful!" I bought these after realizing that I had no envelopes to fit my granddaughter's graduation invites that I made. These were perfect! See attached!. This ol' grandma is still computer savvy and creative! My granddaughter loved them. Hello, These are compatible with laser printing, but because of the linen texture, we cannot guarantee that the finished product will be perfect. Thanks! Are the dimensions in inches? Hello! Yes, all of the dimensions are in inches. Thanks for the question! I need an inexpensive black envelope to fit a card that measures 5&quot; across and 3 1/2&quot; up and down. I need 100 if you have them. Please send me a picture and a price quote. Thanks! Our 4bar envelopes would be the perfect fit! http://www.jampaper.com/ecom/index.asp/show/detail/cat/171/prd/1/c/2/s/65 If you would like 100 the cost would be $24.00 not including shipping. Thanks! Hello! Yes, a 9&quot; x 12&quot; pocket folder should fit comfortably inside the 9.5&quot; x 12.625&quot; envelope. Thanks for the question! What us the paper weight of this item? Paper weight is 32 lb. Hope this helps! Good idea! These would be a good size for small notes. You could probably even go a little smaller if you wanted. Perhaps an A2? http://www.jampaper.com/Envelopes-BySize/A2Envelopes-4375x575. Thanks for your question! When we say in our slogan every size, we're not kidding around. We actually mean every size. From over THIRTY sizes to choose from, your black envelope collection just got the highest upgrade imaginable. Black is a great color to make your event all the more classic. Along with the elegant black color comes the unique linen finish. This brings a little more depth into your card giving, business announcements, and sophisticated wedding invitations. 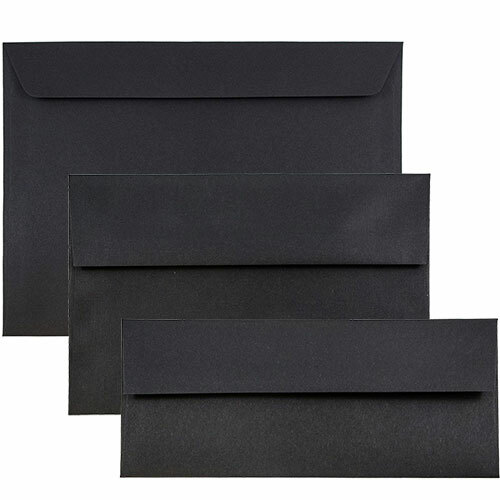 Black Linen Envelopes are 30% recycled with post consumer waste, so your environment will be as happy as you will be after you grab hold of these envelopes. And we almost forgot to mention that there is matching 8.5 x 11 32lb paper and 80 cover also! Now you'll be able to match what's on the inside with what's on the outside. NOTE: Certain sizes are only available in Smooth Black, not Black Linen. Please pay careful attention to the color name when placing an order.